less tolerance of Islamic extremism within Britain. and a new Bill of Rights, so that we can replace the Human Rights Act and better defend our security and our freedoms. Why have so few, if any, preachers of hate been prosecuted or expelled, with those that have gone having done so voluntarily? And why has so little been done to use the existing law to deal with the radicalisation that is rife within our shores? ...Why is the Government still funding conferences addressed by Yusuf Qaradawi, the preacher who said, “We must plant the love of death in the Islamic nation”? Why has so little been done to minimise the impact of imams who come to Britain and preach, often with little knowledge or appreciation of British values? Again, we have made constructive suggestions to strengthen the fabric of our society, including proposals for school exchanges and a national school leaver programme, teaching English to new arrivals, and proper teaching of history to all our children. A year ago I supported the proposal by Dr Siddiqui, Leader of the Muslim Parliament, for the establishment of a Mosques Commission to provide proper regulatory oversight of mosques, and ensure the involvement of young people in their management committees." Editor's note: "ConservativeHome warmly welcomes this new emphasis. The security situation is only going to worsen over coming years and Britain's voters will want a Government that prioritises their security. Labour talks tough on homeland security but only offers incompetence and what David Cameron has called ineffective authoritarianism. With David Davis, the Tory leader must keep on this theme - constantly assuring the British people that a Conservative Government will do its utmost to keep them as safe as possible." A very fine speech in my opinion.It will be interesting to hear what the headbangers who visit this site make of it. Homeland Security? What on earth is he talking about, this is not America. It is Defence of the Realm. And about time too, that the civil rights issues took a back space or two. Criminals and those who conspire to commit criminal acts have no civil rights. Whilst everyone is unhappy about the dealys and absolute chaos at the airports, the cause is a terrorist alert. The fact that BAA, the airlines, Metropolitan Police and government have no joined up plan to deal with the need for increased security should not come as a surprise. The airlines want to recoup the losses that they are incurring, as does no doubt the new owners of BAA to cover retail losses, and the Met Police and BAA are having a spat over increased policing costs. The solution is simple, either the government pays as an indemnity or all parties can sue the arrested terror suspects. That should ensure that crime doesn't pay. Cameron should have used the opportunity to castigate the EU for their failure to brand Hizbollah a terrorist organisation and proscribe them. "Cameron should have used the opportunity to castigate the EU for their failure to brand Hizbollah a terrorist organisation and proscribe them. George, living in the UK just now I have got to say that I am more worried about homeland security than the EU's stance on Hezbollah! National security and crime should really be policies in the bag. I am sure that if David Cameron were to be filmed walking on water there would be posters here who would criticise the walking style and the lack of footwear and say that such tricks are simply not enough. Defence of our realm should be paramount and we should criticise the EU for being very weak. Look at the outcome on the Spanish elections after the Madrid train bombings. Zapatero rolled over and gave the terrorists what they wanted. The EU is too disparate, and we need to distance and get out, their stance on Hizbollah is just one aspect. You forgot to mention that immediate withdrawal from the EU would have improved his walking style and provided adequate footwear. Dear me George, this really is not an EU thread. If anything, Britain should show the EU how to deal with terror - with the exception of Spain (and possibly Italy) we have more experience in dealing with it effectively than any other EU member state. It's not about the EU - it's about effective defence of the realm. I for one wholeheartedly support the police who are working under very difficult circumstances. A good statement from DC. We need to be seen to be tougher than NuLab on terror. "Look at the outcome on the Spanish elections after the Madrid train bombings. Zapatero rolled over and gave the terrorists what they wanted." Actually, he just implemented the manifesto he'd campaigned on. If Aznar's govt hadn't abused the terrorist attacks for party gain (openly lying about what they knew, and pretending it was ETA), they'd still have been in government. Still, never mind, he's been compensated with a position on the board of Murdoch's dribblingly moronic "news" organisation. A good speech by DC. I see John Prescott and Shahid Malik have been quick to condemn. Yes, interesting to see these two popping up to condemn the speech seeing as Malik was slapped down by his own party for his views on what the solutions are. Bill of Rights gets mentioned again, and the ending of the Human Rights Laws. As said already, that will require leaving the EU. Until that is a clear Conservative policy, the rest is just 'ineffective authoritarianism' as per New labour. An excellent and timely intervention from the party leadership. No complaints here. less tolerance of Islamic extremism within Britain." These points highlight where Labour has failed. 90 day detention (did we learn nothing about internment in NI), and ID cards sometime in the future! This simple allowed Labour to grandstand about being tough on terrorism instead of implementing long term effective solutions now. The home office as John Reid put it is "not fit for purpose". Still trying to work out how a department which cannot carry out its basic job over the last 10 years can cope with the added demands of the new terrorist threat. I agree, a good speech and I thought he did well in the Q&A session also. I listened to the 'Tory' Messiah'. What a political opportunist he is. I did not have much time for this character before he went off on his Jollies, I have less for him now. To think I was pinning my hopes and voting for this apology for a leader makes me wonder where my brains were. Now I know this is going to really upset the Tory' faithful, but if Davis is not careful and does not put some distance between himself and Cameron, then he is also going to loose credibility. I cannot see how Davis can preach one thing most of his political life then do a complete U-Turn and expect people to really believe what he is saying. As for Hague, the British Public voted quite decisively to reject this after dinner speech Joker, what makes anybody think the general public want to see him back in front line politics now. Please remember the Tory's will have most of your votes already in the bag, regardless of how things are shaping up, it is the likes of me and a good many other they have got to win over. My vote has never been Tribal. One last comment. I have friends who have been Tory Party Members all of their adult lives, they joined at University. At every GE over goodnes knows how many years they have dropped leaflets through letter boxes in the most adverse of weather conditions, now granted like me they are eldery, but they have already told their association that as they have no respect for Cameron and the direction he ids taking their beloved party, they would not be continuing with their normal pre-election chores. It is a sad state of affairs when such long time loyalists turn like this. Prescott is now demanding that we all act together...isn't he in the Labour Party which sang off key over Ireland? Still that man showed his bravery by visiting the passengers at Teeside and Bradford! Has he ever visited the troops in Iraq and Afghanistan...? Mind you whilst Cameron went to a safe part of Afghanistan he has never visited the troops in Iraq. Now, wouldn't that have been a major PR victory making today's speech in Iraq! Sorry, he should have been speaking to travellers at Heathrow, he should be making this speech if not Iraq in Walthamstow. He should be telling the minorities the old adage 'when in rome' and should demand an immediate stop to immigration. BUT his love of the EU will prove that he is as craven as all the rest. About time he spoke on a traditional theme without turning full circle. That's the most intelligent thing you've said in months Tomtom.Makes a lovely change from the quotes that you drag out of google or wikipedia etc. Speaking as one of the headbangers I think this is long overdue. Naturally it doesn't go far enough for me but all things considered that's probably not a bad thing. The fact that it irritates malcolm shows that it's a step in the right direction. Thank god DC has finally managed to utter a sentence without including the words 'carbon' or 'climate'. Oh! Just re-read malcolm's comment. Apparently we are in agreement about the speech. In my defense I can only say that this was an oversight on my part, I assure my fellow headbangers that it won't happen again. On Islamist Terror more of the same please! However, it is a shame Cameron had to repeat William Hague's "wishy-washy" line on Israel. She should have been supported in its reaction to Hezbollah terror. But it is no surprise that Prescott has moved swiftly to rubbish Cameron's accusations on New Labour's shoddy national security policy, for he has made a point that embarrasses New Labour. Since 1997, they have turned parts of this country into a dangerous sewer (I make no apologies for my language). The Government talks the talk about Islamic Extremism but never leaves 1st base when it comes to protecting the people of this land (Muslim and Non-Muslim). Let's hope this is the start of some foreign policy positions with bite and substance. But when Cameron was actually able to DO something he did the wrong thing -- vote against the 90-day detention period. (Of course Davis is as much at fault as DC on this one). Headbanger in chief reports considerable apathy aroused everywhere by a bland string of cliches and me-tooisms. Goldie & Christina Speight, headbangers out in force now! Well, Malcolm, why don't you respond to my point? These Islamic terrorists can now only be held for 28 days. Does that make you comfortable? Are you proud that it would have been 90 days if Cameron had voted differently? As for being a "headbanger" it used to be called a "Conservative" or a "Thatcherite". I'm still one. Should I apologize for that too now that the rest of you have become pinkos or wets(again)? I've found it highly entertaining to listen to two members of the Government (Shahid Malik and Baroness Scotland) criticise the Tories for 'politicising' the issue - and then they go on and do the same by slagging off DC, calling him a chameleon, etc etc. I usually dislike Peter Allen on Radio Five Live, but he did a rather effective job of exposing the Baroness' hypocrisy. These problems are fifty years in the making. While we have communities that are totally segregated from each other - areas that are all-white, all-Pakistani, all-West Indian, all-Arab, etc, then we are going to have problems. Some parts of Birmingham resemble Karachi or Lahore rather than a blue-collar industrial city in a Western nation. There's nothing wrong with this per se, but we know that certain South Asian or Middle Eastern countries seem to produce quite a lot of Islamic fundamentalists that go on to be terrorists and suicide bombers. And we seem to have exported these conditions whole into our country, without doing enough to integrate them into our own society, and promoting our own values. The Louise Bagshawe piece about forced marriages can come into this. We have not done enough to demonstrate that this behaviour or custom in intolerable in Great Britain, indeed, it is completely against what we supposedly stand for. Sadly I fear that if someone with right-wing political views was to make these points publicly, he'd be stigmatised as a racist rather than have the points discussed intelligently. This is why Cameron won't talk about immigration anymore, despite it being a serious issue, because if he does, he and the Tories will just continue to have the same old tag of being a right-wing, reactionary lilywhite racist party who aren't 'in touch' with Modern Britain. It's an important issue, yet the political and intellectual classes seem incapable of discussing it intelligently. Yes I am proud of that Goldie.Cameron and just about the whole parliamentary party including all the people I respect within the Conservative party felt that Blair was just playing politics by asking for 90 days.Cameron,Davis,Fox,Redwood and all the others put their principles first.Good for them! It is good to see DC finally concern himself with this issue, as clearly, something must be done to try to boost security. I remain a healthy sceptic however - i dont know how the mere act of throwing momey at "domestic security" is going to help, neither am i convinced that creating a new minister will achieve anything. As for a new border police? It seems more likely methods and not numbers and organisation is the problem. Having just watched the press conference, I am very pleased. DC came across as well-informed (he dealt with the questions particularly skilfully) and every inch the statesman, and I'm sure there are countless floating voters out there who will be thinking the same. It was good to see him being constructive and bringing in members of the Shadow Cabinet, in marked contrast to Blair's general approach. Goldie, you’re missing the critical word: alleged. A terrorist can be banged-up good and proper. An alleged terrorist is an innocent person who can expect fair treatment. The threat level hasn’t reached a point where we have to become uncivilised. 90 day detention will not stop terrorism. The Americans, Spanish and Australians only have a single-digit number of days detention (it varies between the three) without charge, and they have all lost more lives to Islamic terrorism than we have. If someone is suspected of committing a crime, then they should get charged, brought to trial, and found innocent or guilty. You know, in the same way that we've done it for the last 300 years. Habeas Corpus is a fundamental right of British citizens. Err no, actually convicted terrorists can be punished by lengthy stays in prison. People not currently convicted of a crime however still enjoy the quaint idea of innocent until proven guilty. There is a difference between a convicted criminal and an accused. Thank goodness for people like you! I am so glad other people are using the word headbangers too - as it really is the only word to do some of the ridiculous posters on here justice! Is there a safe area in Afghanistan? Internment in NI allowed prisoner's to become a martyr to the IRA cause. A policy which would encourage more recruitment to the terrorist cause from within the UK is the last thing we need. Regarding profiling - instead of saying "these are the sorts of people we should pick on" why don't we instead start by saying "these are the sort of people who couldn't be terrorists" e.g. elderly couples. Somehow I don't think terrorists are going to be able to recruit a nice old lady from Eastbourne to blow up a plane for them. I seem to remember that internment (i.e. imprisonment without trial) was introduced in Northern Ireland in the early 70s for alleged/suspected terrorists. I also recal that it did damn all good. Wouldn't 90 days without trial be just 3 months internment? "the appointment of a single minister committed to homeland security efforts". We have recently witnessed, just as the security forces have probably forestalled a terrible tragedy, the infighting between John Reid (who appears to be in charge), John Prescott and Gordon Brown, while the PM languishes on a beach in the WI. What does it take to get them all focusing exclusively on the needs of the nation? 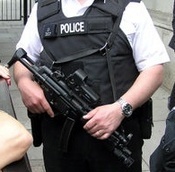 Given the ineffectiveness of government departments such as Defra and the Home Office in dealing efficiently and promptly with crises in recent years, we might be much safer and better served if such matters were under the control of a high ranking member of the armed forces, reporting directly to the PM, and keep MPs well away from such operations. "Err no, actually convicted terrorists can be punished by lengthy stays in prison. People not currently convicted of a crime however still enjoy the quaint idea of innocent until proven guilty." Absolutely right, Lucy; however uncivilised the opposition, we must retain some semblance of being civilised ourselves. I would suggest that anyone arrested on suspicion of terrorism should have to appear before a judge (perhaps in closed court)every 28 days and, if no charges have been brought after 90 days, they would have to be released. You mean someone who reports to Bliar WHILST he languishes on a beach in the WI, David? Surely, such an appointment should report to someone who cares about the nation. This speech is very reassurring it is what we need to hear. The interesting thing which perhaps would- be bombers and/or fundamentalists don't seem to realise is that, even though often appearing self-interested and uncaring (and I agree many certainly seem to be more like this in this present hedonistic era), the general population do care, and EVERY time the so-called martyrs kill themselves (unnecessarily), more people become aware (NOT, and in favour of fundamentalism, but the opposite) and are therefore ready to fall in behind a leader that DEMONSTRATES that they are prepared to protect our borders as well as our people! Mr. Reid has cottoned on to this, but for whatever reason he is still just spinning words, albeit more aggressively. I don't think anyone yet actually believes that he is DOING something positive. So it will be interesting to see the reaction to this speech!! It really does beggar belief that people who claim to be Conservatives can get excited about the Boy Camerob saying - NOTHING! So it's "reassuring" (Patsy); "must be good" (chagetowin); "very pleased" (Tom A:); etc. If I [and it seems, Goldie) are headbangers at least we are not in a catatonic trance worshipping the empty-headed boy. Well, proving that you can be rude also really is nothing to boast about is it? Two wrongs etc. etc. Whilst I am in agreement with you on many things Christina, not least your EU position, constant criticism without any consideration of anything positive, is not a viable debating poistion. "You mean someone who reports to Bliar WHILST he languishes on a beach in the WI, David? Surely, such an appointment should report to someone who cares about the nation." Yes, Jon @ 18.45: that is really my point. This bunch of Nulab politicians have been putting their own personal interests first (Blair's legacy, Brown's insularity etc)that when there is a crisis, we need decisive action in the best interests of the nation. I am also taking into account the fact that when things are not going well at home, PMs tend to go off to posture on the world stage for a while. Posturing is one thing David. Going on holiday and leaving an oaf like Prescott in (notional) charge at a time of national emergency isn't posturing, it's downright stupid and insulting to the people of Britain. He didn't say nothing, Christina. He says he wishes to replace the Human Rights Act. This will require withdrawal from the EU......if he means what he says. After the EPP betrayal, I am not suggesting we believe any of these promises, but if he means what he says, it is not nothing. It is the crux of the matter. I thought it was an excellent speech, and the Q&A was good too. Good job, DC! Dave said the right things today. Maybe his holiday has made him think again about his silence on traditional Tory positions re things like national security. Finger crossed- maybe we're into Dave Phase II. The country is ready. He says he wishes to replace the Human Rights Act. This will require withdrawal from the EU......if he means what he says. Really ? I think you are misinformed. Locking them up kept them off the streets so the Army didn't need to kill them. Had they kept the "B" Specials they might not have needed internment...........we currently have 13.000 people interned in British prisons - "on remand"
Yes it was an excellent speech. The Government is great at specious legislation where competent application of current laws and investment (for once the correct term) in policing & intelligence is the real need. Balanced support where required with critisism where deserved. and he managed to set off Christina & goldie - must be the right stuff. The UK needs to withdraw from the Council Of Europe, not just the EU and from The Convention on Human Rights and perhaps even from the Geneva Convention - the White House also has qualms about the Geneva Convention, it was written to deal with the circumstances of the Great War and is well out of date - it doesn't mean entirely abandoning all rights for prisoners, these can be included in legislation - the UK has had Human Rights down the ages, the Bible and the Koran also set Human Rights, it just doesn't have to be a Liberal set of rights. And also The European Court of Human Rights and European Court of Justice - even Russia and Turkey have had to abandon Capital Punishment to remain members of those. It was an excellent speech and one that will have genuinely resonated with the vast majority of the electorate, especially the currently abandoned "strivers" without whom we cannot win. More of the same please! He has to withdraw from the EU to enable us to make our own rules on human rights. Keep it simple. 90 days versus 28 days gives the Government longer to clean up plots, take suspect into custody etc. You're acting as though these people are regular criminals -- they're not. They're people plotting and planning to kill on an unimaginable scale. It calls for extraordinary measures and the 90 days is a more than reasonable response to it. The wet Tory response of 28 days was not. And that's why his tough speech didn't do much for me. Anyone can talk. And DC clearly can. But I judge a leader by his actions not his words. Goldie et al: why stop at 90 days? Why don't we just allow the PM, Home Secretary and Met police commissioner to round up anyone who looks a bit funny for as long as they like? Long may the Tory party be on the side of the citizen against such over mighty state apparatus. If we drop our opposition to the extension of the detention period, then we should worry about the state of the nation. "Ineffective authoritarianism" is an excellent descriptor of what this government is about and we should fight it. Our leadership is proposing concrete proposals that would make the fight against terror more practicable, particularly the proposition to allow intercepted intelligence to be admissible evidence. Sorry you are just plain wrong I am one of your so called 'Strivers' I thought it was a disgusting piece of political opportunism, typical of Cameron. Not once did we hear a peep from him during his holiday about last weeks terrorist threats. He comes back, thinks he has missed a few 'Brownie Points and done something that the Labour Party never ever done to the Tories during the troubles with the IRA. This man is a despicable piece of humanity. Say anything do anything just get elected at any cost. Then he committed the worst political sin in my book. He broke ranks to speak against the goverment in our times of trouble instead of sanding firm. Any disagreement should have been given privately. He is setting out today what the Conservatives will stand for, I hope he tells the truth and says 'Say anything' the public wants to hear, but just get elected. This is how he is truthfully coming over to me and I do know a good many others. For goodness sake take your heads out of the sand and get Davis in before it is too late. By the way if |I live long enough for the next election , I will come back and apologise if he wins, I will have a damn good laugh if he looses as you must all know he has peaked. Theresa, you’re having a laugh! On 4 Aug you wanted David Cameron to show leadership and speak up. Now he’s done so, you’re criticising him because he “spoke against the government”. So what you actually wanted was to deliver an “I support the government” speech, which would neither true nor leadership. What is the difference between disgusting political opportunism and legitimate debate (apart from whether you're John Prescott or not)? And when did this fantasy notion that Labour never once criticised Conservative policy to the IRA appear in the collective subconcious? How can it be wrong to argue that the government is pursuing the wrong tactics in the "war on terror"(which it is), or that it is managing to implement even those tactics incompetently(which it is)? Look at the amount of debate about the methods, tactics and strategy for national defence (can't bring myself to call it Homeland Security) in Israel. Are you seriously suggesting that all those Israelis who are arguing the war in Lebanon was a failure are somehow traitors to their country? Get a grip. There is no crisis so grave that it should be used to stifle free debate about the means to combat it, and it is only totalitarians and their ilk that would ever stoop to making such a feeble argument. Are you a Labour troll Mrs Stokes? To call David Cameron 'a despicable piece of humanity' does seem to me to be the height of stupidity. If by any chance you are a Conservative I certainly think your support is something we would be much better off without. The Labour party play politics with terrorism all the time,from their behaviour in the 1980's when they voted consistently against the Prevention Of Terrrorism Act to insinuating that ID cards could help prevent bombings to insisting that we have 90 day internment when the police have never needed to hold someone for this length of time. Camerons point about extermists being generally able to preach their hate with impunity and highlighting the fact that our borders are porous are unarguably true. Cameron was right to highlight the inadequacies of the governments response and you Mrs Stokes are wrong. I don't think that those gushing praise for Cameron have actually thought about what he really said. It all boils down to "Blair promised to do 12 things and he hasn't done them". That doesn't strike me as being a world-shattering bit of policy - it's the small change of political scrapping. When the man says something worth listening to like (a) we'll increase the deplorable level of defence spending by x% " or (b) "no imams will be allowed to immigrate solely to preside at mosques in this country without prior vetting" then there'll be something to debate. Forget the Labour attacks on Cameron - they wsere ready-prepared sound-bites. Cannot be done because English Courts will still refer to it and if the Appeal Courts up to the House of Lords do so there is absolutely nothing you can do about it. Malcolm, I am neither a Troll or a Tory supporter, just an ordinary person who is sick and tired with Blair Mark 1 and his Clone Blair mark 2. You see this is the attidude that is keeping you in a permanent state of Opposition. This present goverment has a host of things that Cameron could attack them on. What is not the done thing is to attack them on homeland security in a very obvious (except to the pemanently blinkered) manner. This was cheap political point scoring. However I do take on board you comment about,if people do not agree with all your leader is saying, then you could do without anymore support. I will be sure to print your comments out and pass it around to our friends. One last thing and this is the last, it is obvious 'The Nasty Party' is still alive and kicking if you are an example of the rank and file Tory. There is something wrong with people who cannot stand constructive criticism. Cameron may had the best Education money could buy, but he has not got one iota of common sense. Whereas Davis came up through the school of hard knocks, he is very sensible and it is a pity that some of his wisdom and sheer common sense does not rub off on Cameron. Do not bother to reply, I will not be back on to your blog. Theresa must have missed the bit where David Davis flanked David Cameron. She must also have missed the irony in telling us that "There is something wrong with people who cannot stand constructive criticism" when Cameron's criticism was entirely constructive. Finally she missed that it is Tim's blog, not yours. Oh well. "Then he committed the worst political sin in my book. He broke ranks to speak against the government in our times of trouble instead of sanding firm. Practice what you preach Theresa. "Do not bother to reply, I will not be back on to your blog." Why does that not surprise me, something tells me that DC not only made a good speech but he highlighted some inadequacies in this government's delivery that does not match their rhetoric on homeland security! The British Constitution is based on the Sovereignty of Parliament. Any law can be changed. Unless you think that we no longer exist as a country. In which case I think it's time someone told us. A few folk might have a couple of things to say about it. Theresa expressed the utter frustration so many former Tories feel and the despair that we experience when we witness the me-tooism of Cameron. The fact that we are passionate about our dislike of Cameron stems from the fact that we fear that with Cameron we will not see a real Conservative government again in our lifetime. Remember all, we are the ones who gave Mrs T: a 2nd, 3rd and 4th term and were betrayed by the Howe / Heseltine / Hurd / Major clicque of eurofanatics who sold us out. Theresa Stokes you are plainly not a Conservative voter and patently have never been one. The only conclusion that can be drawn from your remarks is that you are yet another Labour supporter filled with despair by a Conservative party that is saying the things that the voters actually want to hear. The hypocrisy of you attacking Cameron for constructive criticism of Labour's serious failures on homeland security and multiculturalism and then attacking Malcolm for, in your view, not being able to take constructive criticism is absolutely typical of the pitiful self delusion and douible standards that pervade the left in Britain. Oh and if you are as old as your comment about living long enough to see the next election suggests you are then you do not qualify as a "striver" either.Perhaps you might feel more comfortable at Labourhome.com instead. David Cameron for the second time has come out publicly advocating the repeal of the Human Rights Act. If he's a eurofanatic, Christina, he's not read the script properly. I said we had been betrayed ny a [named] "clicque of eurofanatics who sold us out. Cameron is another of the same breed"
Oh please. Talk about cheap rhetoric! If 90 days if authoritarian so is 28 -- what's the philosophical difference my friend? What's the metaphysical difference? Obviously there is none -- it comes down to "reasonableness." I think 90 days is very appropriate in this context, but since you like I don't want to live in a police state there should be limits and I wouldn't be very enthusiastic among lenghtening that period much beyond 90 days. The police said that 90 days would be a good period. It seems sensible to me. 28 days is obviously less than a third of what the police asked for. So the Tories were on the soft side. This puts Cameron's tough words from yesterday in dramatic context. That's all. Ms. Theresa Stokes who is so full of invective, perhaps she would like to give some idea of what Mr. Cameron SHOULD do, or is it just a case of it is so much more fun to knock eveything into the grass, and anyway it is not me (Ms. T. Stokes) who should have ideas - I'm not paid too. That is always a lovely leftwing cop out . Oh and I am sure you will read this, as curiosity will get the better of you! Blimey,Mrs Stokes do you truly believe your original post was in any way shape or form 'constructive criticism'?! Delighted that you will be passing my post to your friends,I always wanted to be famous but then I'm not sure if this is the way you behave that my fame will extend to many people. NB.I notice that TomTom has changed his name on this thread to Rick.Thought so. To say I am angry with people on this blog is the understatement of the year. My Grandmother, Mrs Theresa Stokes gave her honest opinion about things that in her view was not an honourable thing to do. For her trouble she has been insulted, told she is stupid and it is a long time since I have seen her so upset. Her first ever vote went to Harold Mc Millan, she has also voted for Edward Heath as well as Margaret Thatcher, but changed as she truthfully told you that her vote was not tribal, she will be the first to tell you that she voted for Blair twice but has become very disappointed with him. The family has told her not to come near this blog again. I hope you all feel ashamed as you should. Gordon - Thanks for telling the vicious element on this blog just what you - AND I - think of them. They are typical politically correct neo-LibDem creeps and are protecting their useless spineless gutless leader from any derogatory remarks. The man is leading the Party well away from anything that could be recognised as Conservative. Any law can be changed. Unless you think that we no longer exist as a country. In which case I think it's time someone told us. Have you ever appeared before a Judge William ? Have you ever dealt with a High Court Judge ? Do you think they care about what you think ? You have never met such a group of opinionated individuals who think they sit at the right hand of God Almighty and are there to tell legislators and the public just how it is in their court. They will interpret the law any way they choose and if you don't like it - tough ! It is the Act of Settlement you will need to repeal and the Bill of Rights if you want JUdges to do your bidding............you have not a prayer. Tribal Tories seem to resent voters. It is the problem where the insiders get fixated with angels on the proverbial pinhead....it is all about which internal party faction they are allied with and complete contempt for floating voters. The 'Lord of the Flies' bit on this thread has probably upset Mrs Stokes, but it is as well to see just how vicious political activists are if you are not on one of the teams. This is the reason they apply so much make-up and spin to hide the true face of political parties. This is all getting a bit absurd. Shall we draw a line under the name calling and move on? We seem to have a return of the invective posters we had so many of post DCs comments on the nasty UKIP Party, all claiming to be lost Tory voters driven away by DCs moderation who would of course return if we adopted policies that seem to be an amalgam of UKIP & the BNP. I find it best not to rise to the bait from such as Theresa Stokes (if such a person or her family actually exist - curious number of people use the same email account). Ted - Get real and stop sneering and being unpleasant. If there's one computer in the home the Stokes family may well all use it. It's a way proper families behave. The neo-LibDems on this blog cannot get to grips that the opposition to Cameroncomes from long-term Tories - those who enabled us to dominate parliament for years. And as we get older we are freer to work - IF WE ARE MOVED TO DO SO - AND we are most likely to vote. and TomTom "the largest voter-group in the United Kingdom had 41% in the polls". YES we know it and we are a part of it, as were half the Tory voters in Bromley. Until the Party deals with our subservience to the EU and produces some Conservative policies that's the party we'll probably continue to support unless we vote tactically for UKIP in a "Tories For UKIP" to unseat a few more Tories - the europhile ones of course. Christina- the EPP betrayal is wrong. especially the part where Roger Helmer now faces the threat of deselection. This is unforgiveable, and must be reversed, I agree with you. However it was surprising to hear Cameron advocating the repeal of the Human Rights Act a second time. Do you think he actually means it? If so, half a loaf is better than no loaf at all. Don't exterminate all Conservatives just yet. Keep your options open. William - Like so many things about Cameron and his team they blunder into saying things withouut first researching the facts. They talk about restructuring the railways without understanding the EU implications. They did the same about VAT this week. And the Human Rights Act can be repealed but to do so makes not a blind bit of difference because of our EU obligations under the Human Rights Convention. Meanwhile many on this blog - and many MPs and most MEPs - will put their heads in the sand and deplore the EU Elephant in the room making a noise again.